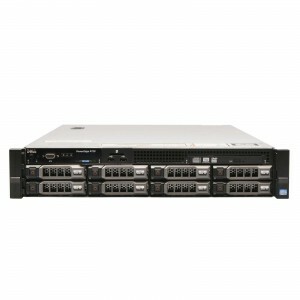 Expertly refurbished by Bargain Hardware, the Dell PowerEdge R720 is a 2U rackmount server that comes at great price. This flexible 12th Generation Dell server is easily capable of large scale database, data warehousing, e-commerce, virtualisation / hypervisor applications. The Dell PowerEdge R720 is powered by up to two E5-2600 V2 Quad, Hex, Eight, Ten or Twelve core Intel Xeon LGA2011 processors with speeds ranging from 2.0Ghz up to a maximum of 3.8Ghz, up to 30MB cache per core and up to an enormous 768GB of DDR3 memory thanks to its 24 DIMM slots. With a focus on a greener more sustainable system, the Dell PowerEdge R720 can be populated with two Platinum Plus rated power supplies, low-power registered server memory and low-power consumption processors for a more economic server that is cheap to run. The R720 has the ability to support dual RAID and a variety of PERC controllers and up to 16 x 2.5” and 8 x 3.5” HDD, SAS, SATA hot-plug drive bays provide a huge range of storage options. All this power is easily managed thanks to the iDRAC7 remote management options. With access to thousands of refurbished quality server components as our corporate customers upgrade their data centres and server farms, Bargain Hardware are able to pass massive savings on to you when you purchase your refurbished system from the online configurator. Please take advantage of our expertise and configure your refurbished PowerEdge R720 to meet your requirements or alternatively, please click on the contact us button.